Metal Products Company | The latest in our projects and machinery additions. 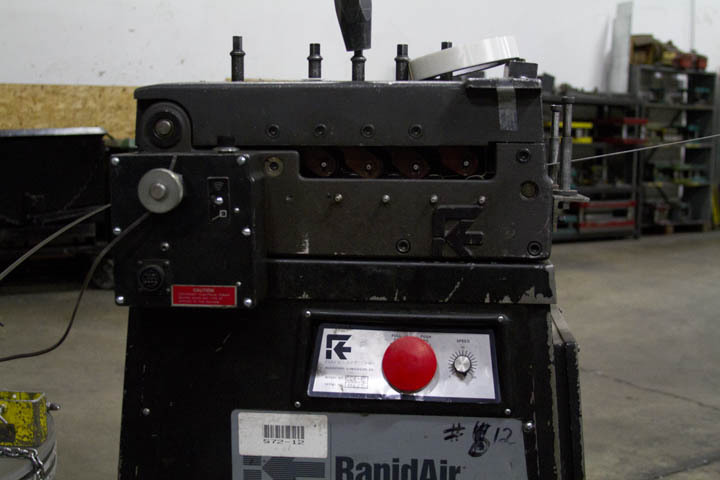 The next auxiliary machine involved with a punch press set up, isn’t always necessary. Material straighteners are used in a hand full of situations, however, aren’t always necessary and their usage depends heavily on the condition of the material and amount of stations within a die. This material straightener eliminates coil-set from coiled raw material. Coiled material will always have a slight curvature to it, due to its tightly wound and banded state. To neutralize the curvature in coiled steel, straighteners have to really make a mark on the material. In the picture above, there are 9 straightening rollers. The pressure from each roller bends the material in different directions to eventually even out the material. As the material enters from the right, the first rollers apply the most force, and as the material moves to the left and towards the press, the rollers weaken in force applied allowing for the deformations to gradually even out, making the material straight. The other common situation where a material straightener is required is when the material is being ran through a progressive die of more than three stations. Running material through multiple stations means that there are multiple forms, hole piercing, or cutting that needs to be done to create the desired part. Because of the multiple operations that need to be done, ensuring that the raw material that is being fed into the press is as straight, and flat as possible is paramount. Having the material be consistently straight helps ensure that the die will run as it is designed, and eliminate any backing up of material or malfunctions that could be detrimental to the die and stamping press. Next week, we’ll take a look at feeders, the ever important auxiliary equipment that keeps the material churning into the stamping press. This entry was posted in Metal Stamping on May 28, 2014 by johnatmetalproducts. The Pittsburgh Business Times is reporting that Jeep is strongly considering making the next generation of Wranglers from aluminum. Jeep is closely monitoring the success of the new Ford F-150 that is being made with aluminum bodies. Tesla has big plans for a battery manufacturing plant planning to break ground next month, and finish in 2020, but the Wall Street Journal isn’t so sure that it can be done. If Tesla were to be successful, they would be able to churn out as many lithium ion batteries as all of the current plants create today. Women in Manufacturing has announced the date and location of this year’s, Women in Manufacturing Summit. The annual two-day summit aims to retain women currently in the manufacturing world, and attempt to attract more women into manufacturing. The National Association of Home Builders blog, Eye on Housing, takes a look at the most common remodeling projects of 2013. That’s it for the short list of links today. Here’s to a productive start to your week. This entry was posted in Monday Manufacturing Round Up on May 19, 2014 by johnatmetalproducts. To celebrate Small Business Week, CNBC has a story about an increase of American manufacturers exporting goods. The article profiles a handful of small to medium sized manufacturers across the country. Another factor adding to the increase of American manufacturing is robotics. Harvard Business Review touches on “botsourcing,” or the increase of bringing manufacturing jobs back to the US with the implementation of robotic aids. Fosters Online takes a look at a community college in New Hampshire with an eight-week CNC operator program with an astonishing 100% job placement success rate. A Pennsylvania-based cabinet maker is a guest blogger at The New York Times, discussing custom manufacturing pricing. Paul Downs chronicles the difficulties of properly pricing customized cabinets, which can be said for any custom manufacturing operation. Professional Remodeler online has a dual interview with two of the leading re-modelers in the field of “aging in place remodeling.” Aging in place remodeling transforms your home for an ensuing elderly lifestyle, that doesn’t sacrifice a modern look. That’s it for the links, happy National Small Business week to all of the other small businesses out there, and here’s to a productive start to your week. This entry was posted in Uncategorized on May 12, 2014 by johnatmetalproducts. Those who watch over the labor statistics of our service industries are happy about the growth they’ve seen. Market Watch has the brief. Some of the notable growth sectors include wholesale trade, retail trade and arts, and entertainment and recreation. While service industries seem to be on the up, The NAHB’s Eye on Housing report isn’t as optimistic. While they do note that there has been a decrease in the unemployment rate, the construction jobs across the country haven’t increased significantly, and the NAHB blog attributes most of the dwindling unemployment numbers to people removing themselves from the job hunt. In the mean time, Chinese manufacturing has shrank for the fourth month in a row. IMPO Magazine reports that the HSBC’s purchasing manager’s index is again signaling a decrease in production in China, however at a slower rate than what was reported for the three previous months. Solar panel manufacturers in the US and the UK are experimenting with tin in aims of driving down the cost of the panels. International Business Times has the story that breaks down the thought of using tin as an alternative to lead. Contracting Business has a story on the lack of refrigeration repair people on the job market. With a lack of interest from most vocational schools, the low and medium refrigeration repair sector is struggling to replace those who are retiring. A happy Cinco de Mayo to all, and here’s to a productive start to your week. This entry was posted in Uncategorized on May 5, 2014 by johnatmetalproducts. Market Place has an article and radio brief on the future of American Manufacturing. “Middle-skill” jobs are what the future of manufacturing in the US will offer. Pending home sales last month were up 3.4% from February, the first increase in pending home sales in nine months. Market Watch has the brief. Some potential avenues for the previously mentioned “middle-skill” jobs in manufacturing could be with drone manufacturing. North Dakota is banking on that idea, and the drone manufacturers like it out there due to its varying weather conditions, and low commercial flight traffic for test flights. Coca-Cola announced the plans of building a new distribution center in Chattanooga, Tn. The project has been budgeted $62 million, and will be around 305,000 sq. ft.
And for those who find washing your car to be a massive pain in your side, Nissan might have an answer for you. Featured on Wired, Nissan demonstrates testing of their new self-cleaning paint. That’s it for today’s links. Here’s to a productive start to your week. This entry was posted in Uncategorized on April 28, 2014 by johnatmetalproducts.